Rep. Trey Gowdy (R-S.C.) is one of the most respected members of Congress from the Right-side of the aisle. While Gowdy himself wasn't impressed with Trump's performance during his summit with Putin last week, he's always straight to the point on matters of right and wrong. This past Sunday was no different for Gowdy when he joined Fox News' Bret Baier on "Fox News Sunday" to talk about the President Trump's summit with Russian President Vladimir Putin, Russian interference in the 2016 election and whether Trump colluded with Russia at all. Gowdy couldn't have made his point clearer on the latter of the subjects. "I have not seen one scintilla of evidence that this president colluded, conspired, confederated with Russia, and neither has anyone else, or you may rest assured Adam Schiff would have leaked it," Gowdy said. 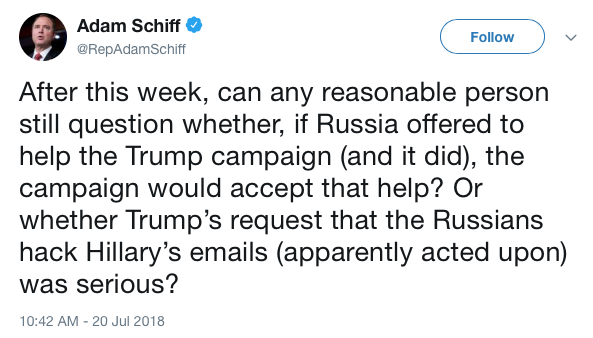 Gowdy's jab at Schiff came just two days after Rep. Adam Schiff (D-Calif.) continued to accuse Trump's 2016 presidential campaign of colluding with Russia. Thank God people like Gowdy are there to put people like Schiff in their ideologically-driven places.